We are continuing to get much needed rain in Big Bear this week with an increasing chance of afternoon thunderstorms through the weekend. This is a beautiful time of year in the mountains and if you haven’t experienced it, I highly recommend coming up and cooling off. This weekend finishes off the Big Bear Cycling Festival with the 5th Annual Tour de Big Bear rolling through the Valley. If you are driving around town during the race, please use extra caution. If you are looking to get in touch with your inner knight or lady (or wench 🙂 ) head on over to Fawnskin and take part in the 13th Annual Big Bear Renaissance Faire. Food, music, entertainment, vendors, games and more await you! 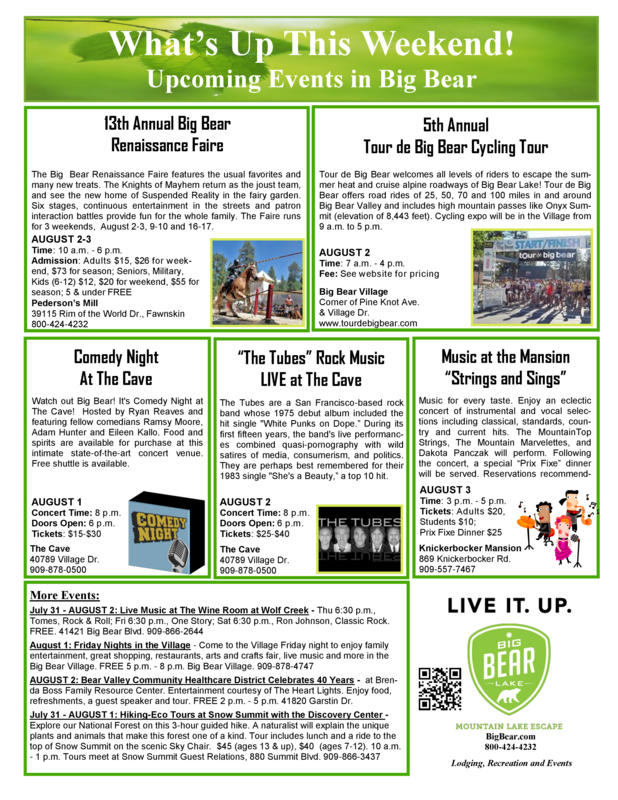 Check out the flyer below to get more information on these and other events happening around Big Bear Lake this weekend. If you are looking for a clean and well-appointed cabin for your next stay in Big Bear, be sure to check out the ‘Our Homes’ tab on this blog or visit our website at RSVacations.net. No matter what your reason for visiting us, we have the perfect cabin for you! Book your Big Bear Getaway today! !